The Dunagiri ancient temple is a few kilometers away from Dwarghat and is more than 2500 meters above the sea level. This place offers the widest paroramic view of the Himalaya and its snow covered peaks. The temple derives its name from the combination of two places rather two peaks of the higher Rangesand. This temple is covered with rich history and regional stories. According to the legendary tales, Lord Hanumana found the medicinal herb plant on this Dunagiri peak that saved Lakshmana’s life. Again, on the other hand according to the Mahabharata, Dunagiri was the abode of the Pandavas. Later the temple was constructed in this very place. All in all, this place is beautiful especially for its cool and calm surroundings that have proved to be a tourist hotspot and a place for meditation for many saints who look for solitude. How popular is Dunagiri Temple? People normally club together Binsar Forest Retreat and Sitalakhet while planning their visit to Dunagiri Temple. People also prefer to end their day with Dunagiri Temple. Great place. On the top of hill surrounded by mountain. You fill feel the peace and energy. My peaceful abode. The temple is a very calm and serene place, with a very spiritual aura in the air. It can be visited from dwarahat, from where you get local transport for dungairi, and then yiu have to climb few stairs. It can be done by people of all age with moderate health. The stairs have a shed above it to protect from sun and rain. The place is bit cold when you climb up to temple, better to pack a sweater if you are planning to visit here. The nearest famous place is a Ranikhet, the house of Kumaon Regiment, which is about 45 km from temple. The temple has a annapurnalaya, where you can get free prasad (puri and aloo) of you reach before 1200 pm. Very nice temple must visit here, people say if you come here and wish for anything , maa dunagiri will fullfill your wishes , and later you can donate a bell in temple. All newly weds couples visit here to take blessings for maa dunagiri. 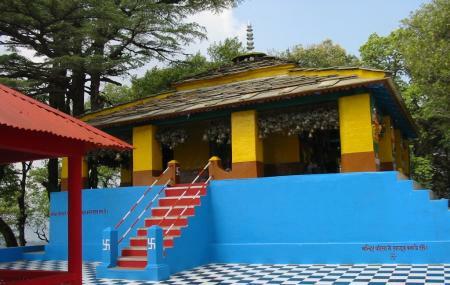 Visit : Ancient Temple of Uttarakhand with history related to ramayana epic. Theme : Religious / Nature Lower / The Great Himalaya View Place : Temple of Shakti (Devi/Goddess). Popularity : frequently visited by locals. State : Uttarakhand District : Almora Distance from major tourist places : From Ranikhet : 48 km Road Condition : Good Place Location From Dwarahat : 14 km About : This place comes in Almora district in the state of Uttarakhand. Dunagiri is also known as Doonagiri and Drongiri. Its located at a height of 2, 390 meters. Dunagiri is famous because of Dunagiri Temple or Temple of Shakti (Devi). The 350 steps leading to the temple are surrounded by majestic peaks and the melodious sounds of nature. The Dunagiri temple is also associated with the Indian epic, Ramayan as it is said Hanuman ji dropped a piece of the sanjivini buti at this place. A must visit for the positive vibrations and absolute peace and calm.